I'd lost most motivation do anything really and that included my blog. I have had a some pretty big set backs these past few days. Nothing bad has happened exactly to trigger things but I know things haven't been too good. I'm back eating very little and starting to count calories to a big extent. But I'm ok. I'm tired of things, I know something is wrong, but I'm ok.
As an aspiring author that quote really appeals to me. I love throwing plot twists in randomly when it comes to my own book that I'm writing, so for some reason I find it quite comforting. 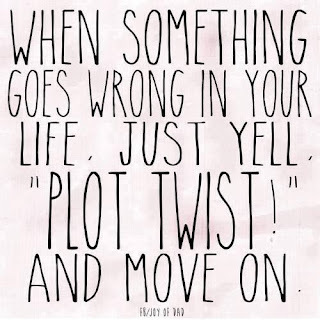 But other than focusing on the 'plot twist' bit of the quote, I want to focus on the 'moving on' bit. I know that I personally really struggle from 'moving on' from any bad things that might have happened to me, and trust me when I say this, but this week has been full of bad things. I have had a panic attack at my friends house, felt sick every time I smelt food, Have had an argument with my mum, came close to falling out with my friend of 14yrs, almost blacked out, been ill, was so close to throwing up every time I ate and struggled finding motivation to live and wake up on a morning. This week had been crap and yet I'm ok.
Every fibre of me wants to focus on how bad this week has been. I want to cling on to it like my life depends on it. I want to mull over in my mind everything I could have done better, I want to torment myself for hours about how I should have known better about how I should have stopped that panic attack from happening. But I can't let myself think like that anymore. My problem is that I can't move on. I can't have something bad happen to me, shrug my shoulder and then just move on. I CAN'T DO that. I am a naturally negative person but I want to start challenging my negativity. I don't want to cling on to these bad things any longer. I want to move on! I'm ok because I've decided to hold onto the good that happened this week. It's been hard but I'm managing. Yesterday I managed a massive milestone in my recovery. I haven't self harmed in a year! Yesterday was the year milestone. It has been a hard year but with God, and some very good friends I've managed to do what I though was impossible. This week has been crap but getting through yesterday makes it possible for me to say that I'm ok. I know not every week I will have such a fantastic achievement to hold on too. I know that some weeks I will feel like I haven't got a single thing to cling too. But I know that I can change how I think. I can't always control what happens to me. I can't prevent every bad thing, somethings I can and I will. But I can and will change how I think. I can challenge my negativity,I can challenge the way I think. 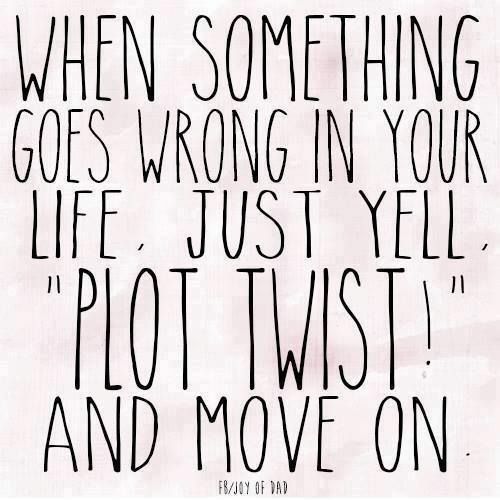 I can make the decision to yell 'plot twist' when something bad happens and I can make the decision to move on. It will be hard but it really is possible. Growing up is a scary thing and in all honesty, I can't stand it. I don't understand that at the age of 18 and now being considered an adult I have to act differently and all my old childish but comforting habits need to be demolished. I don't understand why I get disapproving looks when I don't do things others my age do. Now that college is over people of my age are making the exciting transition to Uni or full time work, but mainly uni. I've just came out of college with an BTEC Extended diploma and a Sup diploma in forensic science. It's more than enough to get me into uni but I'm going back for a 3rd year at the hell hole more commonly know as college to study business. In the movies the shy girl will speak. She'll find a man that understands and she will be come brave. Her audience a sea of those who doubted her. In the movie she opens her mouth and starlight comes out. An enigma unraveled in the pale blue of her voices. People sit shocked, unable to move. They listen to her voice like their new favorite tune. In the movie she is loved. They surround her in a summers embrace. When the day turn grey they rush to her side. Holding her close, her tears fall no more. Life isn't a movie though, the shy girl won' be loved. She will speak of course, but they're not listening. Her voice isn't going to hold them captivate, no. There won't be anyone to run to her side. When the shy girl speaks it will be too late. She knows deep down though, she wasn't welcome to begin with. Her tears will fall, alone. A year or so ago I was at an even called New Wine. During the week went to a seminar called 'my friends scars'. It was all about self harm and how as a christian we can support recovery with people who self harm and how we can use the bible to help ourselves if we were struggling fighting it. I don't remember too much about it to be honest, much to my annoyance that year I was too shy to make notes during the seminar, this yea I learned my lesson and took a note book with me. However, 16 year old me did make one not on a scrap of paper, I sadly lost that piece of paper until this afternoon where I found it. On that piece of paper was the word 'kintsukuroi'.